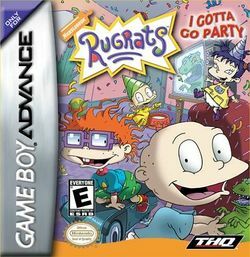 Rugrats: I Gotta Go Party is an action game that was developed by Eurocom for THQ and released for the Game Boy Advance on November 8, 2002; as the name implies, it is the thirteenth title for the Rugrats series, and the last to be released for a handheld system (except for spin-off, All Grown Up). An all-new game has Tommy searching for the rest of the Rugrats to join in a round of action-packed mini-games. The more Rugrats he finds, the more mini-games are opened. Better hurry, the action doesn't start until you find the first Rugrat! This page was last edited on 21 November 2016, at 16:16.